In theory, carbon offsets facilitate low-cost emissions reductions. In practice, they’ve done anything but. Carbon “offsets,” a feature of most cap-and-trade systems, build on the sensible premise that emissions should be reduced wherever that can be done at the lowest cost. Offsets give CO2 emitters facing carbon caps a cost-minimizing choice: they can reduce their own (domestic) emissions through the usual means: investing in or incentivizing energy efficiency and use of lower-carbon fuels; or they can buy carbon offsets that pay for actions elsewhere — typically in less-developed countries — that reduce or avoid emissions, achieving the same net reduction. Ideally, carbon offsets finance low-carbon energy projects (e.g., wind farms and solar arrays) or projects to reduce emissions from deforestation. Reflecting this duality, the United Nations Environment Programme administers two offset programs: the “Clean Development Mechanism” (CDM) and the “Reducing Emissions from Deforestation and Forest Degradation” (REDD) program. The European Union’s “Emissions Trading System,” the world’s largest cap-and-trade system covering about 45% of greenhouse gas emissions from 31 countries, utilizes both CDM and REDD offsets. Similarly, California’s AB-32 cap-and-trade program, which started in 2013, includes offsets from five categories: U.S. Forest Projects, Livestock Projects, Ozone Depleting Substances Projects, Urban Forest Projects and Mine Methane Capture. Emitters can use offsets to meet up to 8% of their compliance obligations, but since California’s cap declines 2% per year, offsets could represent a large fraction of total emissions reductions under the cap for some time. Why, and how, offsets have proven hard to evaluate and easy to game. Offsets were a major feature of the Waxman-Markey cap-and-trade bill that passed the House in 2009 and of parallel Senate proposals in 2010. They were packaged into those bills as “cost control” measures to moderate energy price rises from steadily tightening the cap on CO2 emission permits. Offsets clearly appealed to both polluters and potential recipients of offset funding, in effect providing political “grease” to smooth passage. But in 2008, a year before Waxman-Markey came to a vote, close analysis suggested that many intended offset projects wouldn’t result in real emissions reductions. This raised concerns that a large supply of unverifiable offsets would overwhelm the emissions certainty claimed for cap-and-trade. Later in 2008, the nonpartisan Government Accountability Office assessed the EU’s offset program under its Emissions Trading System. GAO found that over-allocation of allowances and offsets had resulted in “a price collapse.” As a result, Phase I of the ETS had “uncertain” effects on emissions in the capped countries while funding offsets of doubtful value, though GAO did hold out hope that reforms could make the system work. The picture grew darker. GAO’s 2011 follow-up, “Options for Addressing Challenges to Carbon Offset Quality,” reported that in 2009, 81 million tons of offset credits — an estimated 59% of the ETS’s CDM offsets for that year — went to Chinese refrigerant factories to incinerate HFC-23, a chemical byproduct of refrigerant manufacturing whose per-pound greenhouse gas potency is 11,700 times that of CO2. According to GAO, the Chinese had constructed 19 new refrigerant manufacturing plants for the sole purpose of destroying the greenhouse gas byproduct in order to receive offset credits and the associated payments. According to estimates by Stanford professor Michael Wara, whereas installing equipment to capture and destroy HFC-23 at all of the facilities covered by the CDM would have cost just $100 million, these same projects were expected to generate $4.7 billion in CDM offset credits. In 2011, EU officials finally acted to eliminate this perverse incentive, announcing plans to stop accepting offset credit for HFC-23. The Chinese government responded by threatening to vent HFC-23 straight to the atmosphere. [A]ll projects abating HFC-23 and SF6 under the Kyoto Protocol’s Joint Implementation mechanism in Russia increased waste gas generation to unprecedented levels once they could generate credits from producing more waste gas. Our results suggest that perverse incentives can substantially undermine the environmental integrity of project-based mechanisms and that adequate regulatory oversight is crucial. Poor information creates vast opportunities for manipulation. While the HFC-23 sagas seem almost comical and are probably the most costly and egregious example of abuse of offsets, they illustrate a serious problem with practically all offsets — asymmetric information. Purveyors of offset projects know a good deal more about their “products” than do far-away “buyers.” And unlike the highly leveraged mortgages that were sliced and repackaged into intangible derivatives that helped crash global financial markets in 2008, offsets start out as intangibles. GAO and other analysts of carbon offset markets group these information deficiencies into three categories: Additionality, Measurement, and Verification. They also raise concerns about the permanence of sequestration projects like forests that can later be burned as fuel, relinquishing the climate benefits that were bought with offset credits. Table is from 2016 EU report noted in text directly below. 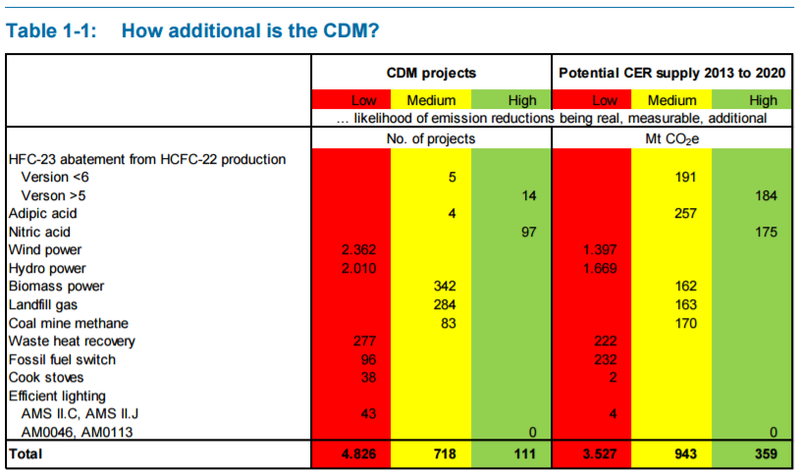 CDM = Clean Development Mechanism. CER = Certified Emission Reductions. Additionality is the problem of answering a hypothetical question: what would have happened if offsets hadn’t funded this project? GAO identified many projects that got a boost from offsets, but with no clear sense as to whether they would have been built anyway without the added incentive of offset credits. Asking “What is the baseline” is inherently counterfactual, and thus untestable and unanswerable. It’s been a challenge for the UN and EU ETS to even write rules about how to review projects (which vary widely in concept, location, quality and cost), while the offset “industry” and large purveyors of offsets, particularly China, have clamored for ever more streamlined UN approvals. A 2016 report prepared for the EU Directorate-General for Climate Action, How Additional is the Clean Development Mechanism, concluded that “the vast majority of ‘clean development’ projects [financed by carbon credits] likely fail to actually reduce emissions,” as Inside Climate News summarized in an April, 2017 story. “Given the inherent shortcomings of crediting mechanisms, we recommend focusing climate mitigation efforts on forms of carbon pricing that do not rely extensively on credits,” the report said. Measurement is a complex accounting problem — how much CO2 was avoided by this project or process or by preserving this forest? GAO found that measurement is neither consistent nor transparent, even after a decade of effort by the UN. Verification concerns who is checking on the projects’ completion, operation and maintenance. GAO reported that “Project developers and offset buyers may have few incentives to report information accurately or to investigate offset quality.” Everyone in the offset business – from project developers to offset sellers and buyers – wants offset values set as high as possible. GAO argues that strong, independent oversight is needed, but its report raises serious doubts about whether oversight can ever be sufficient, especially given its high administrative costs. [A]n offset program may create disincentives for policies that reduce emissions. For example, under an offset program that allows international projects, U.S. firms might pay for energy efficiency upgrades to coal-fired power plants in other nations. According to our previous work [GAO’s 2008 report on the EU ETS], this may create disincentives for these nations to implement their own energy efficiency standards or similar policies, since doing so would cut off the revenue stream created by the offset program. For example, some wind and hydroelectric power projects established in China were reviewed and subsequently rejected by the CDM’s administrative board amid concerns that China intentionally lowered its wind power subsidies so that these projects would qualify for CDM funding. In addition, our review of the literature suggests that in some cases an offset program may unintentionally provide incentives for firms to maintain or increase emissions so that they may later generate offsets by decreasing them. This potential problem is illustrated by the CDM’s experience with industrial gas projects involving the waste gas HFC-23, a byproduct of refrigerant production. Because destroying HFC-23 can be worth several times the value of the refrigerant, plants may have had an incentive to increase or maintain production in order to earn offsets for destroying the resulting emissions. [T]he emissions reduction program would ensure that only a fixed percentage of the emissions permits could be affected by any problems with offset quality. All existing emissions reduction programs we reviewed use this option. In the EU ETS, regulated entities are able to use CDM credits for 12 percent of their emissions cap, on average, through 2012. In contrast, a draft Senate bill [the “American Power Act”] would have allowed a greater number of offsets into the program—approximately 42 percent of the emissions cap during the first year of the program. These percentages are based on the total emissions cap, not the required emissions reduction. As a result, such limits could mean that regulated entities could use offsets for all of their required emissions reductions, assuming a sufficient supply of offsets was available. In other words, offsets could have completely overwhelmed the Waxman-Markey bill’s cap (which only declined a few percentage points each year) for decades — precisely what Prof. Wara predicted just days before the bill passed the House in 2009. Proponents of AB-32, California’s cap-trade-offset program, assure us that offsets won’t overwhelm its emissions cap. Yet the intrinsic problems of offset quality will require extensive and aggressive oversight. In cap-and-trade systems, a carbon allowance represents the right to emit a ton of CO2. Typically, allowances are auctioned or distributed to greenhouse gas emitters up to their cap levels. Thus, emitters will have surplus allowances to sell if they reduce emissions below their cap. Allowances function much like currency with attendant opportunities for fraud and manipulation. Offsets add another potential opportunity for mischief. To the extent that offsets fail to actually reduce emissions, they’re effectively a way to counterfeit money. One of Friends of the Earth’s “Ten Ways to Game the Carbon Markets” (2011) was “carouselling,” in which carbon allowances are used to evade taxes. In 2013, Interpol issued a “Guide to Carbon Trading Crime” detailing real-world examples. There’s no doubt that funding is needed for low-carbon energy and good forest practices in developing countries. Unfortunately, real-world experience indicates that offset markets are a questionable funding source. Offsets drive down allowance prices in carbon markets, resulting in weaker incentives for decarbonization, while uncertain offset quality undermines the certainty of emissions caps. A price floor, such as the $10/ton floor specified in California’s AB-32 program, can prevent a total collapse of allowance prices. Yet a simple, direct carbon tax offers an even clearer and more predictable price signals to CO2 emitters while creating far fewer opportunities for manipulation, fraud and crime.